For soaking: Add two cups of Epsom Salts to warm water in a standard-sized bathtub. Double the Epsom Salt for an oversized garden tub. Popular for easing muscle pain and fading bruises – bathe three times weekly, soaking for at least 12 minutes. Epsom Salt (when absorbed through the skin) works to relieve muscle tension, pain, and inflammation in joints Tired and sore feet will also benefit from the therapeutic warmth of an Epsom salt soak. Aside from these benefits, Magnesium sulphate has several other positive effects to note. It aids in many enzymatic functions, helps to regulate fluid retention in cells, and facilitates the body’s use of calcium to transmit chemical signals throughout the nervous system. 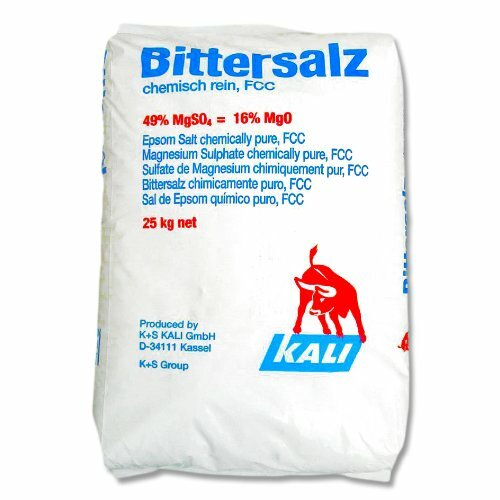 Kali-GmbH are the leading brand in Epsom Salt, it is top quality, taken from natural deposits and 100% organic. The product is mined in Germany under strict European Union Quality Control Procedures and is both Kosher and Halal Certified. BEAUTY/ COSMETICS USE: Epsom Salt also works great as a beauty product when used correctly. You can utilise it’s properties to make your own fantastic homemade products such as; Salt Scrubs, Facial Wash, a Hair Volumizer (when mixed with your everyday conditioner), an exfoliating agent or even to create your own custom scented Bathing Salt, depending on your tastes, it’s very easy to do! All of which will help reduce stress and bring some clam and relaxation to your bathing routine. GARDEN AND PLANT USAGE: You may be surprised to know our Epsom Salt has practical uses in the garden too! Tomatoes, for instance, need lots of Magnesium to grow to their full potential. Epsom Salt can be a great, cost-effective way of getting this essential nutrient into your crop. The same applies for Peppers, it is very beneficial, to their growth, aids in germination, produce greater yields, improved beauty and strength of the peppers. Here at Elixir, we are confident that the combination of quality and price of our salts cannot be beaten. Beware of cheaper, inferior salts imported from other parts of the world. Always check, the place of origin and the manufacturers certification.Consult a professional for advice if being used as a remedy for skin disorders or medical conditions.